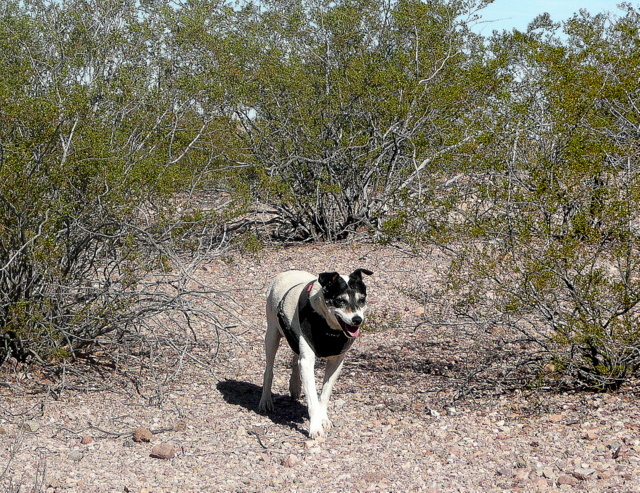 It’s a windy day here in the Sonoran Desert in southern Arizona. Not the kind of weather to lounge around outside, so the crew and I are off to the laundromat. I’ve accumulated two big laundry baskets full of dirty clothes and quilts. As usual, I use up about ten dollars in quarters. While waiting for the washers to stop spinning, a guy comes over to me and starts a conversation. 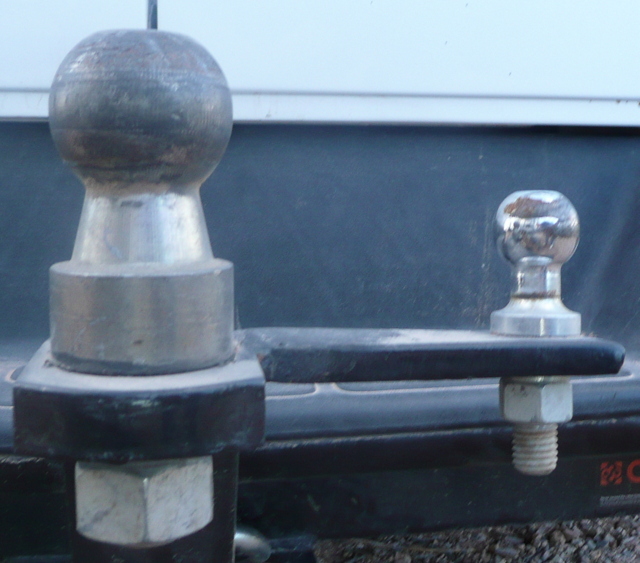 “What’s that extra hitch ball for?” he asks, looking through the big window at the Perfect Tow Vehicle. After a while, I learn his name is Wayne and he’s a full-time vagabond, too. “That’s my van out there,” Wayne proudly informs me, nodding to a rig parked next to the PTV. He tells me it’s a Chevy Tiger/Provan GT. It’s well-equipped with similar amenities as in the Best Little Trailer. The top pops up, turning it into the looks of a Class C with a bed over the cab. After getting the okay from Wayne, I take some photos. To see the latest “Tiger Adventure Vehicles” produced by Provan Industries, West Columbia, South Carolina, click here. The video shows their new Siberian Tiger model which is promoted as suited for back-roads camping. It’s pretty neat. There are other models available and you can get them with solar panels installed. The washers stop spinning and I busy myself with loading up dryers. Wayne is camped at the golf course. He gets full hook-ups because he looks out for the place, like a camp host. I tell him about my blog and wish him safe travels before pulling out. Once home I look up the Ajo Golf Course online and find a website with a video showing Ajo and its golf course. This wind is ushering in rain for tonight and tomorrow. That’s what the forecasters say anyway. They also predict colder weather. I keep switching my clothes from the PTV to the BLT and from the BLT to the PTV to match the weather. A closet-on-wheels is very convenient. 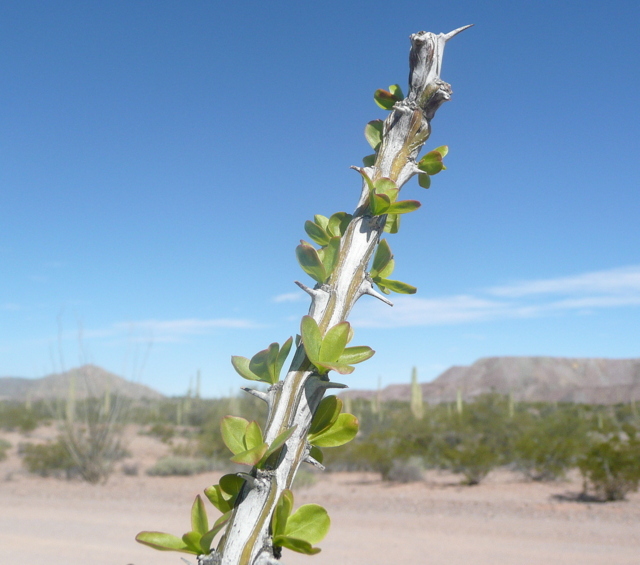 The ocotillo are sprouting leaves. This time last year I photographed several different kinds of flowers. I miss seeing them scattered about, such cheery, little surprises when hiking the desert. All of a sudden Spike jumps up from his look-out station at our open door. He takes off, barking his “hey, what are you doing on my property” bark. I get up from writing this blog to see what’s the matter. It’s Miriam whom I met yesterday, walking the road in front of our campsite. She waves. 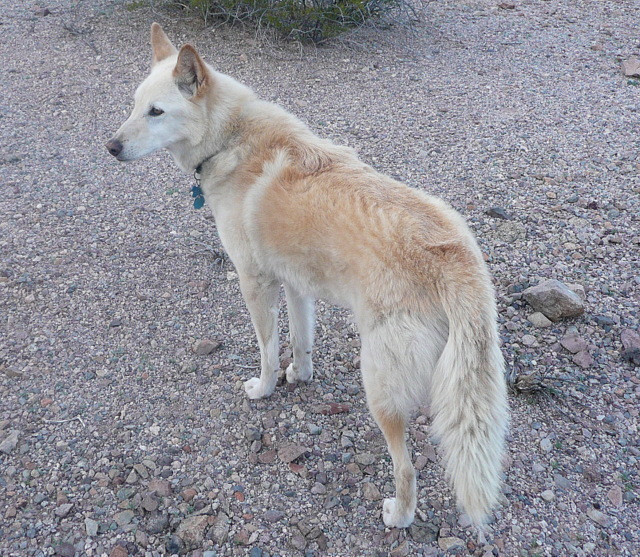 Lucha, a beautiful, part-shepherd dog, accompanies her. 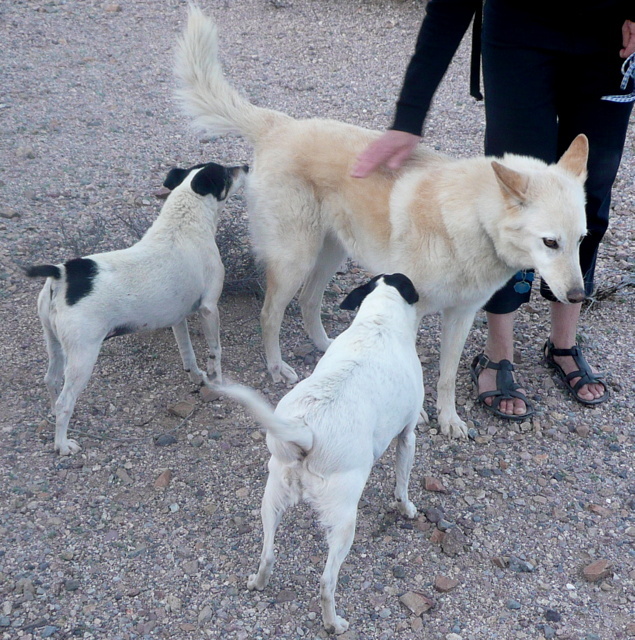 The crew make Lucha’s acquaintance in typical canine fashion. She’s a bit shy, but who wouldn’t be with Bridget and Spike nosing around like they do! Miriam leaves tomorrow to return to Boston. I wish her a good trip as I hustle the crew back to the BLT. The wind is cold! Hmm . . . This is a good night for a soup supper. This entry was posted in Simple living and tagged Ajo, boondocking, campers, Class B, desert, dry camping, golf, hitch, provan, rat terriers, RVing, Sonoran, Southwest, stabilizer bar, tiger. Bookmark the permalink. You could keep that storm down your way. It’s headed for us tomorow and they are forecasting 12-14 inches snow for us. We need the moisture though. Ah, Spring is coming. I love this up and down weather this time of year – means Spring is really coming. Stay warm. Hi Emily! Great attitude when facing 12-14 inches of snow . . . You stay warm, too. How nice to see a new post when I came back to hit the Amazon link. 🙂 Lucha looks like her other half might be golden retriever or yellow lab or something like that. Not looking forward to rain tomorrow. I had been enjoying the warm weather. Oh, dear Connie, you warm my heart with that first line of your comment. The warm weather was nice. One day felt like summer. Soup…..great idea and easy. I think warm food is going to sound good the next few days. Enjoyed being your neighbor for a couple of weeks. Hope we get to do it again. Why are you at Why? Well, Why not! Ha! It would be good to see you again. When I was touring Kitt Peak Observatory recently, I met a couple full-timing in a Provan Tiger. I had never seen one before so they graciously gave me a tour of the rig. Pretty cool! This is the first one I’ve ever seen. The videos of the newer models are quite intriguing. Saw a ProVan a few years ago on a Chevy truck chassis and it was quite a unit. The Chevy Astro that that ProVan is on is a NICE rig, Geri and I both had Astros and the were very sturdy, on truck frames. Emailed them to see about putting one on Beastie(taking off the 5th wheel bed). Beautiful, patient part German Sheperd. Very WINDY here!!!! A bit breezy here. I guess you didn’t get the snow. I can see it on the mountains. Enjoy your company! Soup for supper sounds good. I think I’ll make some tomorrow night. We should be seeing some of our blizzard by then. Every time someone comments about the depth of the snow or that a blizzard is on its way, I feel an ache. I remember trying to function under such conditions and it ain’t easy! There are people who love the snow and winter, but I’m not one of them. Keep cozy, Linda. The Tiger hasn’t much ground clearance for off road driving. Looks like a Eastern model for camping. Out west we need something more substantial that would stand up to the enviromental conditions that make the west the west. Give us some pintal axles and 16 inches of ground clearance as a base to start with, then get some German engineers to design a real off road machine that will live up to the name of Siberian Tiger. Did you look at the videos of the new models? Yep and they sure look pretty but they are no Pinzgauer that can go almost anywhere and are sold and serviced right here in Arizona. The Pinzgauer was a military vehicle that was made back in the 60’s and 70’s. But are not in military service anymore. Their top speed is only 55 mph or so, so they won’t work good on the freeways. Off road they can’t be beat. And for a Expeditionary Vehicle with a house on its back the Unimog is the way to go. These both have about 17 inches of ground clearance and can climp over downed trees and over boulders that is hard to believe even when you see it before your very eyes. My wife likes our Toyota Tundra 4×4 and won’t let me have a new toy boo hoo hoo. You’re welcome, Val. Yeah, they’re too much for me, too. It’s fun though to look at what’s being produced. Read the website about the Ajo Golf Course. It is not free open parking for anyone who wants to pop in for the night or a week or two. On the website, it is a limited # of days for those who are using their facilities. In other words, if you come in and pay the golf fees, you can park free. That’s odd. Wayne works there and he said golfing wasn’t necessary. He only suggested patronizing the restaurant. I did forget to mention there was a day limit. Im just trying to share,, But please folks get the shot … Sue Im sorry for this long comment, but I just would hate to see anyone suffer for lack of not knowing..
What a powerful message you’ve given me and the readers of this blog. You’ve done a great service here, especially if you prevent one person from going through the misery of shingles like you’ve suffered and continue to suffer. I am so sorry you have these major health issues. You sound like a good person, and apparently a patriarch of a big family. That’s something of which you should be extremely proud, and I bet you are! No need to apologize for the length of any comment, especially one as heartfelt and important as yours. I’m happy to read that you had seven years on the road when some people never leave town. I bet you have great memories and stories to tell. Thanks for taking the time to write, John. That does it; Sheila and me are getting ours tomorrow..I know some folks who have it, and John provided the nudge that we needed to make up our minds. Thanks! Nosing around is what dogs do to say hi. They are much better at introductions that their peoples. Maybe you should be watching and reading a little of Dog Whisperer and Cesar Milan. Should? I should? Are you saying I don’t understand dog behavior? You’re kidding me, right, Mike? I often write things in a way to make my blog light and entertaining. I’m glad you enjoy my blog. Perhaps he hasn’t been following your blog long enough to know better..BTW, we are just a couple of days away from hitting the road, yay! Just waiting for enough good weather to allow me to install the solar panels on the RV. Heading down the Oregon coast on our way to AZ. I read that you might be enjoying temps into the low 80’s by the first of March! One thing you can count on, Bruce, Arizona will get warmer as the year progresses. 🙂 Have a wonderful time on the road and at the destinations you choose! Its just after 3 am and the rain is starting to hit Tucson right now. I am up because Curley Joe decided he needed let out. My time in AZ sure has been different than I had imagined it would be. 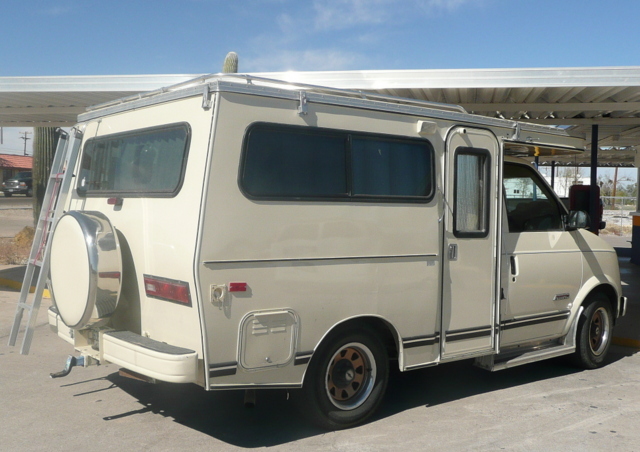 Still waiting on upgrades to my brother’s RV, a Minnie Winnie similar to mine. It’s been one delay after another on his rv, but I am sure it will all be taken care of soon (I hope). And now I need to get the tow pkg conpleted on my RV to be able to tow my new toad. So excited! I’ll be able to do those backroads in the desert without dragging Lady Blue’s be-hind through the gravel !! Congratulations on getting a toad! You’ll have the freedom to explore without hurting your beautiful home. It’s raining here, too. Same here, Mark. My devotion to the crew only goes so far! Love Bridgett’s round body profile! Bridget is a curvy girl! I was just re-reading your posts from when you first picked up your Casita. Your so funny Sue and you have great material with Spike and Bridget. I noticed at the beginning you were using a toaster and I was wondering, can or do you still use it? I thought that it took up to many watts or amps when you rely on Solar. It sure was Hot when you were in Texas. I’m so glad I will be there in March/April. I hope I do as well as you did at the beginning . I might be able to back down a mountain,but I would definately be cussing up a storm because I would be scared.In a post you said that so many people were helping you and you hoped that one day you could help others. You have Sue and continue to every day you post. You are most certainly paying it forward. Just wanted to thank you for taking the time to do the blog. I and others appreciate it. Have a nice day and maybe someday you will see my little Nash camping in the desert. Sweet of you to thank me so graciously, Laurie. You will do as I did… You start out unsure of yourself and as you meet the challenges and have a wonderful time doing so, you learn and realize it’s not difficult at all. No, I don’t use my toaster, as you suspected. Toast — rye toast specifically — is one of my favorite ways to start a morning… along with a cup of coffee. Maybe one day I’ll go where there are hook-ups (gasp!) just for the sole purpose of toasting some rye bread to go with my coffee. Sue, can you see the snow on the mountain? It is north of the rv park I an at in Why. Yes!! That entire range visible from here was white with snow this morning. I tried to take photos of the mountains. I haven’t checked yet to see if the mountain snow is visible in them. It looks like most of it is gone now. Lucha looks like a sweetie! Funny how the crew is giving her the sniff over! Bridget and Spike are always ready to make a new pal. BTW, greens are keeping fresh! I enjoy following your daily life, I spent the majority of my adult life living as you are, I had a van conversion that I lived in for ten years the last time (I even made a wood stove for it, I lived in the NW). I am married now and just doing camping trips but maybe some day will at least winter over in the SW. WE have an Aliner but I really like your Casita, a bathroom would be nice. Hello, Rik, and welcome to my blog! 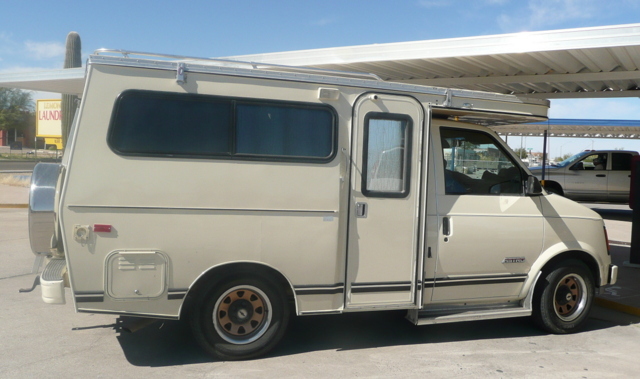 Your van conversion reminds me of Rusty’s set-up (Rusty is a friend and reader of this blog who comments here. You may have read about him in a September ’12 post.) He has a pick-up which he made into a camper, including a wood stove.